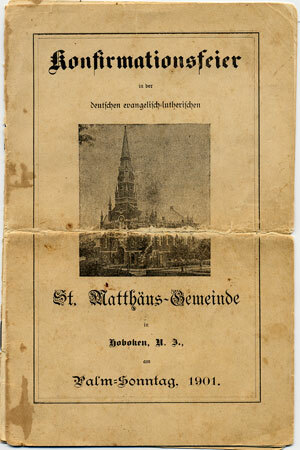 Meta Petermann was confirmed in St Matthew's German Evangelical Lutheran Church on the corner of 8th and Hudson Streets, Hoboken, New Jersey on Palm Sunday, March 15, 1901. My mother gave me a copy of Meta's confirmation photo and an original of the Confirmation Program years ago. 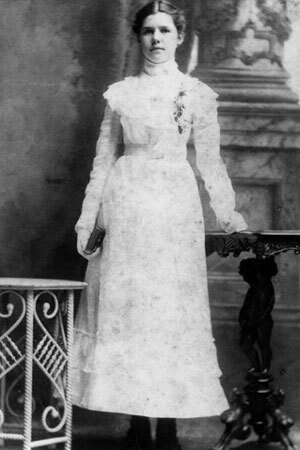 Meta's confirmation photo from my copy. To return to the Petermann introduction page, click on the photo of Meta. The phamplet contains the service in German. Unfortunately, it is not completely readable at a resolution that makes sense for the size of the computer screen. 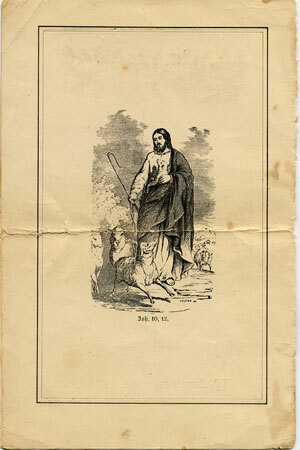 None-the-less, it is one of the few documents from the Petermann family. 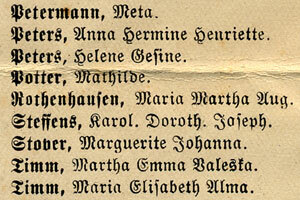 I have enlarged the section that is on page 8 and includes Meta's name. I used some of the graphics from the pamplet as illustrations for the Petermann pages.